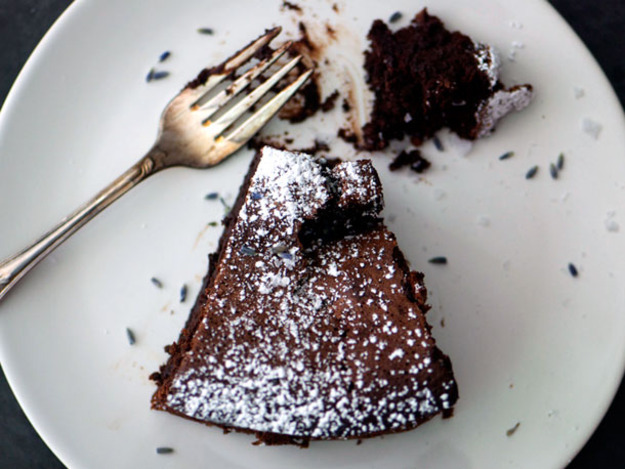 The best chocolate cake recipe the world has ever known. For me, baking is therapy. Eating the baking is another kind of therapy, but baking with my 9 year old twins is something that brings us together, and helps us set a goal, work together to achieve it as a family, and celebrate when we’ve completed the job. Cakes make us happy. This flourless low sugar chocolate cake was first made by my son and me, and has become a regular staple on our family’s baking agenda. ♥ Preheat the oven to 180°C and grease and line a 22cm round spring-form cake tin. ♥ Place butter, chopped chocolate, cocoa powder and boiling water into a medium saucepan over low heat. Cook stirring until chocolate and butter are melted. Set aside. ♥ Beat egg yolks and sugar, using an electric mixer, for 5 minutes or until thick. Set aside. ♥ Using your electric mixer, beat egg whites until soft peaks form. ♥ Add the chocolate mixture and almond meal to the egg yolk mixture. Mix until combined. Gently fold the egg whites into chocolate mixture. Pour into the prepared pan. Bake for 35 to 40 minutes. Cool cake completely in pan. We love placing raspberries on top or roasted walnuts (see image) when it has cooled, and serving with thick cream. This looks sooooo delish! Thanks for the inspo! So simple! I can’t wait to try out this chocolate cake on the weekend.